With four M.2 slots, and 16 PCIe channels, it outruns the capabilities of most PCs and software. If there’s any review I’ve been anxiously awaiting to write, it’s this one. Having seen demos at vendor showcases, I knew NVMe SSD setups could go far faster than what’s possible with the single M.2 slot most PCs offer. To see HighPoint’s 7101A 4-slot, x16 PCIe NVMe RAID card reading at 11GBps reading and writing at nearly 10GBps on PCWorld’s own testbed was a major hoot. Alas, that’s using a synthetic benchmark, and in our real-world copy tests, performance was only slightly faster than with a single fast NVMe SSD. HighPoint said that with the right software, i.e., something that does its own I/O such as synthetic benchmarks, you will get the same dramatic performance boost. We’ll have to take the company at its word, as the 7101A also served to illustrate a number of shortcomings of current PCs and software when it comes to state-of-the-art storage. The Highpoint 7101A is a full-length x16 PCIe card with four M.2 slots arranged vertically and hidden behind a black shield/heatsink. Not that you’ll need a heatsink for everyday use, but these things go into machines that stress the drives constantly during demos. It’s there if you need it—I left it off during my tests as there was little heat to shed. This is the 7101A without the heatsink. It’s basically just four x4 M.2/PCIe slots and a RAID controller. To install the SSDs, you must temporarily ditch said heatsink by removing six screws on the back of the card. The drives are installed as you normally install horizontally oriented M.2 SSDs, by sliding them into the slot and securing the opposite end with a screw fitted into a post. There are screws already in place, and they’re the same size as the heatsink screws, and the company includes four extras. That’s a nice bit of redundant design that we don’t always see. You could just plop the 7101A into your computer and have it function as four additional PCIe M.2 slots. Note that it needs to be an x16 slot, and your PC must have sixteen free CPU PCIe 3.0 lanes. That’s hardly a given. More on that in a bit. Highpoint does provide a driver and there’s also a web-browser utility for enabling RAID functions. As you might imagine with four slots, several flavors of RAID are supported: RAID 1, RAID 0, RAID 5, and RAID 1/0. 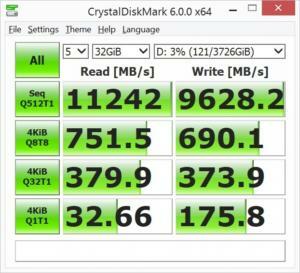 To test the full potential of the 7101A I installed four WD Black NVMe SSDs in RAID 0, then ran both synthetic benchmarks and our real-world 48GB copy tests. It aced the synthetics but took first place in the copies by only a gnat’s eyebrow. Also, getting the 7101A to run a full speed wasn’t easy. There are any number of gotchas that your setup might throw at you, which I’ll discuss in the next section. While the synthetic benchmarks showed wonderful performance, to achieve the best scores (shown below) in CrystalDiskMark I had to up the number of queues in the sequential test from the default 32 to 512. That was on the advice of Highpoint, and means the results should not be directly compared with that of any other NVMe drive or RAID combo we’ve tested so far. They’re still very impressive to look at, though. CrystalDiskMark tends to be a tad optimistic about performance, but even so, these numbers are indicative of some potentially blazing performance. The chart below shows the CrystalDiskMark results with both the standard 32 queues and HighPoint-advised 512 queues compared to the Samsung 970 Pro, the fastest single consumer NVMe SSD currently available. As you can see, the 7101A has it all over the 970 Pro for sustained throughput in CrystalDiskMark, but the 970 Pro was actually quicker on most random functions. Not an unexpected result considering the overhead RAID induces. 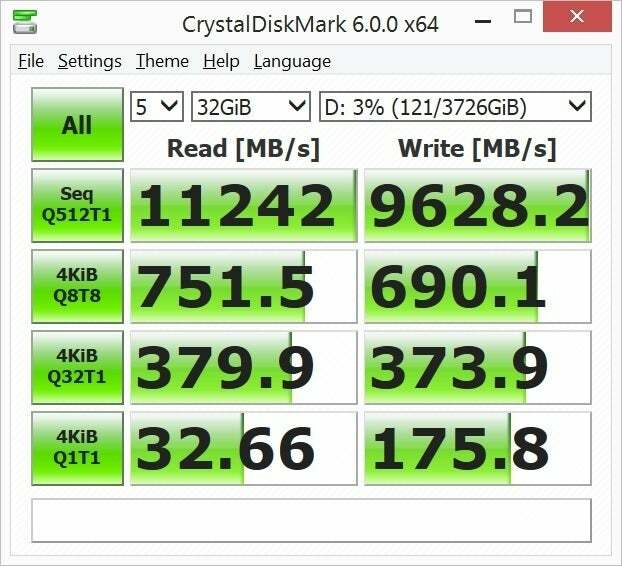 Everything was sunshine and roses with CrystalDiskMark and AS SSD 2.0 (not shown but claiming about 5GBps), but the 7101A came beck to earth during our 48GB Windows copy tests. While I wasn’t expecting the kind of throughput CDM showed, I was expecting more than the extremely mild improvement over the 970 Pro you’ll see below. 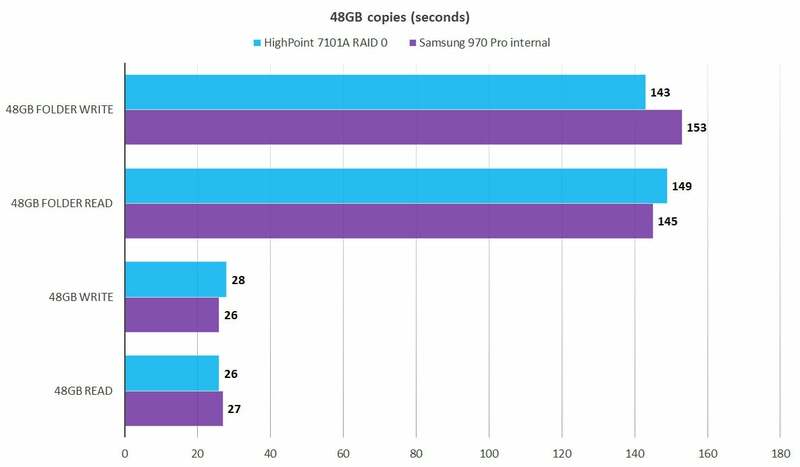 As you can see, there was hardly any difference between the 7101A and the 970 Pro when it came to simply copying data between a RAM drive and the SSDs. Windows itself is quite possibly the limiting factor. 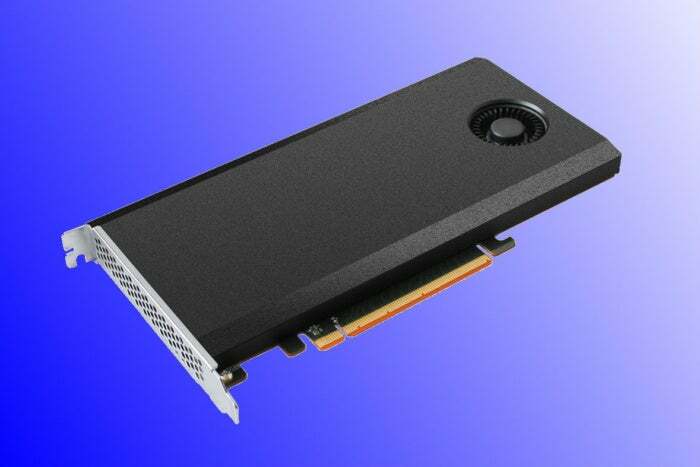 The company confirmed that the card will reach its full potential only with high-performance software. That apparently doesn’t include Windows. As mentioned, the scenario covered on Highpoint’s website is all about a vertical high-resolution video editing and processing solution. Installing the four WD Black NVMe 1TB NVMe Pro SSDs was a breeze. But getting the setup to work in our testbed with its Intel Core i7-5820K/Asus X99 Deluxe motherboard combination with 64GB on board was not. Not hardly. The X99 Deluxe is rather cantankerous about allotting PCIe lanes, so it took some futzing, as well as removing the Thunderbolt EXII Thunderbolt 3/USB 3.1 card, to free up enough PCIe lanes so that the slot the 7101A was installed in would actually operate at full x16. 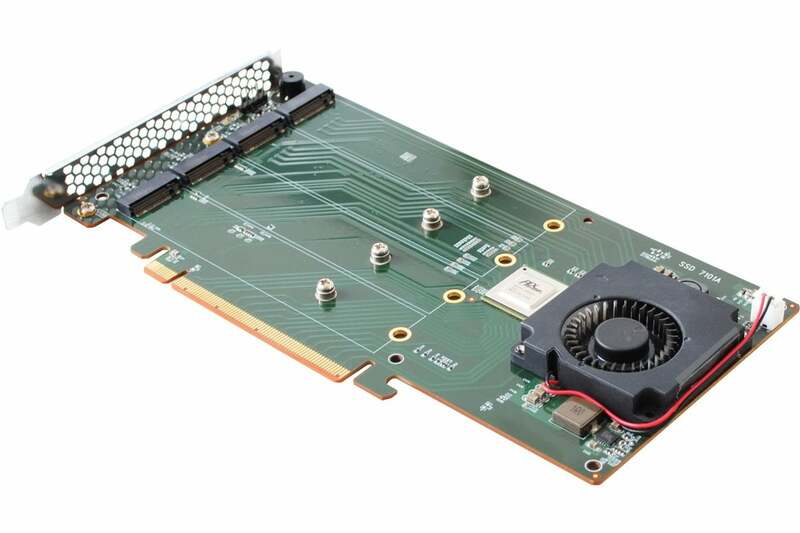 The 7101A will work with eight or even four PCIe lanes, but not at its full capabilities. . Note that when you install the card, you want a slot that is using the PCIe 3.x provided by the CPU. The PCIe lanes provided but the chipset/southbridge are throttled by the DMI interface, i.e., they’re slower. How many lanes are available will depend on your CPU: if you have a 40-lane or better CPU, you should have enough CPU PCIe lanes unless you’re running more than one graphics card. If you have a 28-lane CPU, the only way you’re going to be able to use the 7101A is by ditching your x16 graphics card for an x8 or x1 model. I used an x1 Zotac GeForce 710 model, though the slot it occupied was still alloted two PCIe lanes. If you’re using an Intel CPU with integrated graphics and 16 lanes, you just might be able to run the 7101A at full speed if you have nothing else utilizing the CPU’s PCIe lanes. That’s a big if. Note also that you can’t boot from the 7101A. For that you’ll have to wait for the upcoming 7102A. The 7101A is a product with huge potential. The synthetic benchmarks aren’t lying—they just do their own I/O, which is what any software that wants to take full advantage of this card will have to do. At the moment, that sadly doesn’t appear to include the Windows operating system. So for now, the 7101A offers a lot of expense with little real-world benefit other than adding four M.2 slots to your system. Software that can take advantage of this type of performance will undoubtedly appear, but probably not very soon. Kudos to HighPoint for the board, and a small raspberry to Microsoft for not being able to utilize its full potential in Windows. While the synthetic benchmarks indicate blazing potential, real world performance on a Windows PC is little better than a single fast NVMe drive. That said, it's a very easy, albeit expensive way to add 4 M.2/PCIe slots to your system--if you have enough PCIe lanes to accommodate. A product for the future or specialized vertical software such as high-end video editing and rendering workstations.